There are some aircraft which are legends because of a particular piece of history. 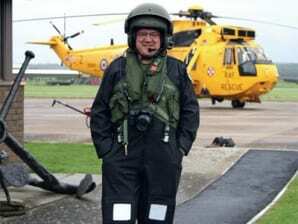 In this I am thinking about the Spitfire and the Battle of Britain. Completely unfair, of course, as everyone knows it was the Hawker Hurricane that won the battle, not the Spitfire. Or do they? Public perception is a difficult thing to break, and as time passes spectacles become rosier, facts become less distinct and romantic ideals replace cold hard facts. That’s one of the reasons I hate writing this page, somehow I have to condense that kind of altered viewpoint into a few paragraphs. Not easy, especially in this case, as the Tomcat does not have one legend about it, it’s one of those rare aircraft with three. The public perception of Grumman’s mighty fighter is one based on movies. 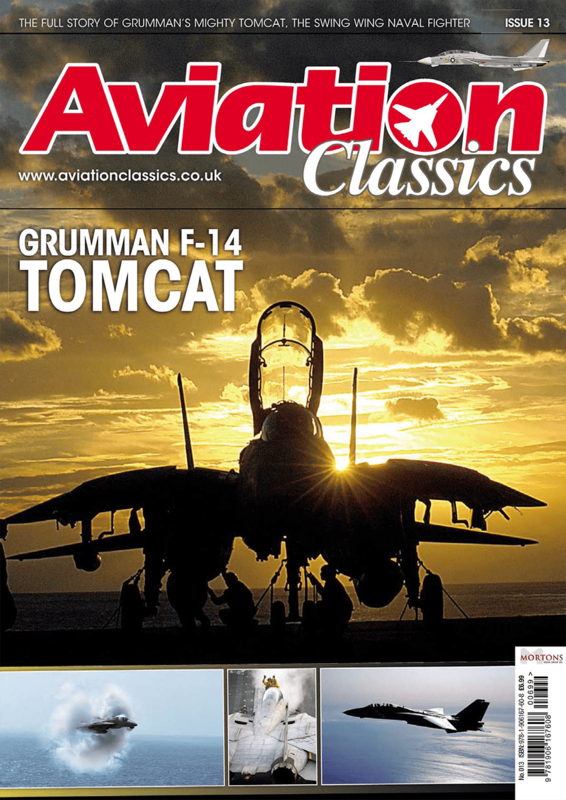 Top Gun and The Final Countdown cemented the Tomcat in the public’s mind as the ultimate superfighter, sweeping all before it with ease and elan. Challenging that image is difficult, because it has become part of popular culture and therefore a “fact”. The aviation “expert” perception of the aircraft is as different as it could be. “Overweight and underpowered” and “turkey” are just two of the epithets slung at the Tomcat by detractors or people who don’t really know or understand the aircraft. Quotes from influential politicians and high ranking officers are used as ammunition to support their view that the Tomcat was a poor performer and an expensive mistake. Oddly, on reading further, the quotes thus used seem to be either out of context or incomplete in many cases. Then there is the third legend. This one is matter of fact, not loud or showy, it just states things with a quiet smile and a rueful nod to the fallibilities of both man and machine. But the statements, quietly made, by the men and women who hold this legend dear are astounding. “Yeah, we managed to get a solid lock and fired, the missile came off clean and climbed sharply. The drone was just over 120 miles away at the time.” Please note that carefully. 120 miles. “Funny, for all talk and stories, I can’t remember ever having a problem with the (TF-30) engine, I don’t recall it getting in the way much, if at all.” A much maligned turbofan, suddenly, not that big a deal. “We were covering two operations from the Mediterranean station, up north to Bosnia, and down south to Southern Watch over Iraq. Had a good long loiter time for the FACs, too.” Missions flown at very long range, yet able to stay and provide friendly cover. This last legend is the one I have learned from producing this magazine. Of course, it is the legend owned by those privileged to maintain and operate the Tomcat. If you chose to listen to it, it is a very calm and matter of fact voice, stating the real achievements and capabilities of this machine with quiet pride and gentle good humour. “Yes there were problems, but what complex combat aircraft doesn’t have those? Anyway, difficulty is to be overcome, right?” And didn’t they just! The real story that led to the Tomcat is one of cancelled plans, political ineptitude and inter-service incompatibilities. The story from the point Grumman started working on its 303E design is one of vision, skill, and genius. Once the aircraft was accepted into service it is a story of overcoming limits, finding solutions and developing them. Once the F-14 reached the squadrons, it is a story of dedication, pride, courage and performance. That is the story I wanted to tell, the legend I have learned about and wanted to encapsulate in these pages. Only you will be able to tell if I have succeeded, and I sincerely hope I have. This aircraft deserves its story fairly told, because aside from being an astoundingly capable machine, it is also an extraordinarily beautiful one. 8 Why move the wings? David I Roberts explains a brief history of swept wing and variable geometry aircraft up to the TFX. Bird flight being the inspiration for the earliest dreams of men taking to the air, the concept of variable geometry has been around since the earliest attempts at designing (or imagining) a flying machine. From the mythical Daedalus and Icarus via the (probably fictional) dark age British King Bladud to the 11th century monk Eilmer of Malmesbury and many subsequent reckless tower jumpers, most early would-be aviators sought to fly by flapping wings strapped to their arms, without any realistic means of control or even a stabilising tail. The exception was Leonardo da Vinci, who in 1487 sketched an ornithopter powered by the arms and legs of a prone pilot, and featuring a “rowing” motion. In other words, the wings could move fore and aft as well as up and down; this was almost certainly the first considered partial design for a “swing-wing” aircraft. Leonardo, despite his anatomical expertise, never quite grasped that it was torsional flexure of the feathers or membrane in the vertical stroke that provided forward thrust, and thus lift, but his research into aerodynamics remained the most comprehensive and detailed for centuries afterwards. In later life he concentrated on fixed wing gliders. One, a sail-wing hang glider with a remarkable resemblance to Sir George Cayley’s 19th century wing designs, was recently replicated and, with the addition of a fin, proved capable of piloted flight. Designers of later ornithopters, some of which succeeded in flying in model form, and even at full size by the 20th century, preferred to concentrate on the mechanically simpler vertical motion. Fixed wings, or something approaching them, were more promising, as Leonardo had discovered four centuries earlier. Clément Ader, whose Éole reportedly made a brief hop-flight at Armainvilliers, France in 1890, equipped his fantastical steam-powered, bat-like creation with no less than six hand and two foot controls, none of which proved to exert much useful influence over the craft’s attitude and direction. Among the control systems was one by which the wings could be moved independently fore and aft to combine the functions performed in more conventional (and successful) aircraft by ailerons and elevators. Ader might have been better advised to equip his machine with a tail, as already developed by Sir George Cayley and Alphonse Pénaud, and with simpler, more manageable controls, but he was apparently the first person to leave the ground in a variable geometry aeroplane. His twin-engined Avion which followed embodied the same principles and, despite claims to the contrary, was no more successful. Coincidentally, the name Ader is close to the Welsh word for bird, which is aderyn. Sweepback was ignored until researchers such as John W Dunne in the early1900s explored the stability it conferred on fixed-wing aeroplanes, about both pitching and yawing axes. Given the drag-producing profusion of struts and bracing wires typical of Edwardian aircraft, its potential for greater speed was not significant at the time. From 1907 Lt Dunne, initially employed as a kite designer at the Army Balloon Factory, Farnborough, designed a series of swept wing tailless gliders and powered aircraft which were tested at Blair Atholl in Perthshire under great secrecy, being the first aeroplanes to bear camouflage. In 1909, when the latest machine, the D.4 biplane, was finally beginning to get results, the British government, as so often, withdrew funding, and in 1910 Dunne set up the Blair Atholl Aeroplane Syndicate with the Marquis of Tullibardine, contracting with the Short brothers to build subsequent aircraft and testing them mainly at Eastchurch. By 1912 the D.8 was proving so stable that a French pilot, Commandant Félix, was able to leave the controls and climb out onto the wing during a demonstration at Villacoublay. Ill health forced Dunne to retire from aircraft design and testing, but W Sterling Burgess in the USA acquired a licence to develop aircraft embodying his principles, selling various models, including seaplanes to the US and Canadian navies. One such seaplane, delivered in 1914, was Canada’s first military aircraft. Swept wings saw little other use before the First World War; notable British examples were the Handley Page monoplanes and the G biplane, all having the swept wings with curved leading edges pioneered by José Weiss, who believed, correctly, that such wings, tapering in thickness from root to washed-out tip, would give automatic stability. During the war, however, the British services and manufacturers took no further interest in the principle. Albatros built a couple of experimental conventional biplanes with considerable sweep and another German company, DFW, produced its Mars Pfeil (Arrow) reconnaissance aircraft in some numbers. Austro-Hungarian companies Lohner and Oeffag also initially made two-seaters with rather acute sweep. Lohner fitted swept wings to their very successful biplane fighter flying-boats, which were copied almost exactly by the Italian firm of Macchi. Excessive stability soon proved a liability as fighters evolved, and sweep angles were reduced to modest values on later two-seaters by builders such as Rumpler, Halberstadt, Hannover and AEG, who also applied it to twin-engined bombers. The main exponents of modest sweep in France during this period were Nieuport on their fighters and two-seaters and Morane-Saulnier, who applied it to late war monoplane fighters. The principal benefit in all these cases was an improved view from the cockpit. Sweepback can also be useful by allowing a greater range of centre of gravity travel. Acute sweep enjoyed a revival in Germany soon after the war, when aviation was limited almost entirely to gliding. A photograph from about 1920 shows a small tailless biplane hang glider, clearly inspired by Dunne’s work, apparently with Alexander Lippisch aboard. Lippisch collaborated with Gottlob Espenlaub to build a series of tailless gliders through the 1920s, and continued to design swept-wing aircraft, both gliders and powered aeroplanes, through the Second World War, the most famous product of his research being the Messerschmitt Me163 Komet. His research also doubtlessly influenced the adoption of swept wings, which delayed the onset of compressibility at high subsonic Mach numbers, for the Me 262 Schwalbe. In 1931 he had realised a swept wing could be made to carry more payload, with little loss of efficiency, by extending the centre-section aft to fill in the ‘V’ partially or completely. The delta wing was born. After the war, Lippisch moved to the US to help with, among other things, delta wing development. While he did not work on variable geometry, the planform of most swing wing aircraft, in which the wings at full sweep effectively combine with the tailplane to create a delta wing, owes much to Lippisch. Two other important German pioneers, the brothers Reimar and Walter Horten, also developed tailless swept-wing sailplanes, which evolved into true flying wings of high aspect ratio and extreme aerodynamic cleanness. Some were converted to powered aeroplanes during the Second World War, and their twin-jet fighter-bomber, the Gotha 229, flew in 1944, with tragic results when test pilot Erwin Ziller was killed following an engine failure which showed up the aircraft’s Achilles heel, its marginal controllability under asymmetric thrust in the absence of a fin. The second, unflown, prototype was taken to the US, where its low radar signature impressed engineers. Combined with Jack Northrop’s contemporary wartime design efforts, Horten research contributed considerably to the American flying wing and stealth bomber programmes. Again, variable geometry was not involved, but the Horten brothers had put the high-speed potential of strongly swept wings firmly on the map. A Messerschmitt design, the P.1101, to meet a 1944 requirement for an emergency fighter, was partly completed by the end of the war. Having a single engine with a nose intake, it was planned to make its Me 262 wings adjustable before, but not during, flight to a sweep of 35, 40 or 45 degrees. The prototype, about 60% complete, was eventually taken to the US, where the Bell Aircraft company, interested in the type since its discovery, took charge of it in 1948. It was never completed and was eventually scrapped in the 1950s, but it provided some data for construction of the X-5, of which more later. In Britain, which between the wars had otherwise largely ignored acute swept-wing developments, the first practical variable-sweep aeroplane flew at Andover, Hampshire in 1931. The Westland-Hill Pterodactyl IV was one of a series of tailless designs, with which John W Dunne had helped Geoffrey Hill at an early stage. The Pterodactyl types had all-moving wingtips to act as elevons at all angles of attack, and the Mk IV, a three-seat cabin monoplane, added a small amount of variable sweep about its roots and pivoted bracing struts to refine longitudinal trim in flight. A two-seat fighter, the Pterodactyl Mk V, albeit without the variable sweep, was built and compared well with contemporary fighters, but did not see production, its unreliable Rolls-Royce Goshawk engine being a liability. Hill proposed further developments, including a turret-equipped fighter, a four-engined flying-boat and a five-engined transatlantic transport, but none was adopted. The 1925 Pterodactyl IA is preserved at the Science Museum in London, and the family is perhaps best remembered as inspiration for the futuristic machines depicted in the classic science fiction film of H G Wells’s Things to Come. A swept-wing light sportsplane, the Granger Archaeopteryx, inspired by the Pterodactyls and also built with input by Dunne, was the first tailless aircraft to have a tractor airscrew, all previous types being pushers. It first flew at Hucknall, near Nottingham, in 1930, and is preserved near there after years in the Shuttleworth Collection, where it flew again in 1971. It is hoped to restore it anew to flying condition. In 1932, Waldo D Waterman built the first successful tailless aircraft of purely American design. Having swept wings with endplate fins, a pusher engine and a spatted tricycle undercarriage, it was intended for the private market. Its successor, the Arrowplane, won an award for a flight from Santa Monica, California to Washington, D.C. in 1935. That, however, was just the beginning; Waterman was working towards a flying car, a goal he achieved in 1937 with the Arrowbile, which had detachable wings and a Studebaker engine driving both airscrew and road wheels via a clutch. It complied fully with both aeronautical and automobile regulations. Its final development, the Aerobile with a Franklin engine, first flew in 1957 and is preserved in the National Air and Space Museum. Other, more conventional, inter-war swept-wing aircraft are the De Havilland Tiger Moth, the Stampe SVA 4 and the Bücker Jungmann and Jungmeister, all having sweep to ease pilot entry and, particularly, exit in an emergency. Various two-seat reconnaissance and fighter-bomber aircraft of the period, notably the Curtiss Seagull, the Hawker Hart family and the Henschel 126, also incorporated the modest sweep favoured by Germany and Austria-Hungary in the First World War, for the same reasons of pilot view and ease of trimming. In the UK postwar, just as Hawker, Avro, Handley Page, Supermarine and De Havilland were designing swept wing and delta aircraft, the visionary Vickers designer Barnes Wallis had, as usual, leapt far ahead of his contemporaries with the Wild Goose, a supersonic blended swing wing machine devoid of all control surfaces. Conceived in 1949 as a bomber armed with a stand-off missile and arising out of Wallis’s feelings of guilt over heavy aircrew losses in the Dams raid which had been his project, the Wild Goose was to be controlled by a combination of fuselage lift and differential wing sweep, in principle much like Ader’s system of 60 years before, but much more refined and practical. In the event, Vickers had to content itself with building the more prosaic Valiant. Somewhat overshadowed by Wallis’s projects was a patent for a variable-sweep supersonic fighter taken out by the British designer L E Baynes in 1949. It was never built. Wallis’s design evolved into several proposals, including the beautiful Swallow supersonic transport which no doubt influenced Boeing’s planned Mach 3 733 of a decade later. The Swallow had swivelling pod-mounted engines on the wings and a cockpit contained in a cylindrical fairing which could be extended above the fuselage for better visibility in the landing approach. Funding was only obtained for a full-size version of one of these aircraft, a piloted version of Wild Goose to be built by Heston Aircraft as the JC 9. It was cancelled in 1952 before completion, but tests of trolley-launched radio controlled flying models, some rocket powered, proved the concept at speeds up to and above Mach 2. The remote control systems themselves represented a considerable innovation and much research. Tests continued with Swallow models until 1957, when the infamous Sandys White Paper put paid to nearly all state funded aircraft development in Britain. A naval fighter, the Vickers 581 – using Wallis’s swing wings and twin engines above the rear fuselage with ramp intakes – was more conventional, having a fin and tiny triangular tailplanes mounted right aft. When this was turned down, Wallis and his team took the design to Langley Field in 1960 and tried to obtain US funding. He ruefully reported later: “We convinced the Americans too sincerely that this was a great idea so they decided to take it up for themselves instead of paying us a grant to do it in England.” The TFX resembled the 581 only in having a wing glove which blended into the fuselage above and behind the cockpit, but Wallis’s test data were reportedly applied wholesale to the American design. A final project, the Vickers 589, resembling a T.S.R. 2 with Lightning-shaped swing wings, was not proceeded with, but provided important data for the Tornado. 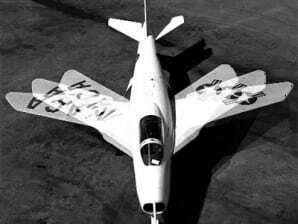 Meanwhile, back in the States, Bell completed the two X-5 prototypes, which first flew in 1951. A more complex wing sweep mechanism than that of the parent Messerschmitt P.1101 allowed the pivot points to move fore and aft for centre of lift compensation, using an electric screw jack to move them and disc brakes to lock the wings in position. Sweep, changed in flight, could be 20, 40 or 60 degrees, and sweeping through the full range could be accomplished in 30 seconds. The X-5 was tested up to Mach 0.9, but its poor tail position, high on a boom aft of the jet outlet and in the turbulence generated by the wings at some sweep settings, led to a vicious tendency to spin, which killed Captain Ray Popson at Edwards AFB in October, 1953 while the wings were swept at 60 degrees. Testing continued until 1955, and the X-5 ended its days as a chase plane at Edwards. The type was not adopted, as had been hoped, as an economically priced fighter for export, but it had proved the viability of variable-sweep wings. In 1951-52, Grumman fitted swing wings and an all-flying tail to a Panther to produce the XF 10F Jaguar in response to Navy concern expressed in 1948 about operating swept-wing aircraft from existing carrier decks, already too small for the latest fast fighters, which had an unacceptably high landing speed. The wing moved between two fixed positions, 13.5 and 42.5 degrees with automatic unsweep in the event of failure, which mercifully worked even when the hydraulic fluid turned to ‘Jell-O’, as happened owing to poor maintenance during the test programme. The wings worked well, but the tailplane, which resembled a small canard delta aeroplane perched atop the fin, was a disaster. Freely pivoted and actuated by its small foreplane, it lacked ‘feel’ and tended to overcontrol, which in turn caused the wing slats to deploy as the aircraft pitched up. The addition of four small fixed fins in a cruciform arrangement around the fuselage failed to alleviate the problem. In the end Grumman admitted defeat and substituted the conventional tail of a Cougar, which solved most of the stability problems. However, like the X-5, the Jaguar also spun suddenly and viciously. Another liability was the unreliable experimental Westinghouse XJ-40 engine, most of the problems with which were eventually traced to faulty assembly of a fuel control switchbox. An overlong cover fixing screw had been driven into the wiring. The XF 10F was abandoned in 1953 after 32 test flights, and a production order was cancelled. The Navy, by then building larger carriers with angled decks, no longer needed it. The flying prototype was relegated to barrier testing, while the uncompleted second aircraft was sent to a gunnery range as a target. Notwithstanding the stability failures of the X-5 and Jaguar, the success of the swing wings prompted NASA to conduct further investigations into the system, using much of Wallis’s work as a basis. It was concluded that moving the pivot points outboard in a “glove“ fairing would provide better aerodynamics and more space in the fuselage. Wallis’s later Swallow designs show evidence that he had already come to a similar conclusion, but he had not yet moved the pivots as far out as NASA recommended in their 1958 report. NASA also designed a simpler sweep mechanism than those of the X-5 and Jaguar. The way was clear for development of the Tactical Fighter Experimental, the versatile low-penetrating supersonic TFX required for the 1960s by both the USAF and the US Navy. The last operator of the F-14 in front line service is also the only export customer for the aircraft. 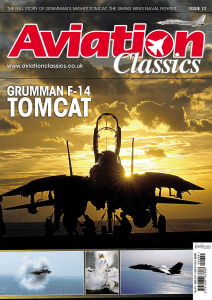 David Oliver tells the story of Iran’s acquisition and combat use of the Tomcat. In 1941, Iran’s pro-Axis stance led to an Anglo-Russian occupation of the neutral nation to protect the oilfields belonging to the British-controlled Anglo-Iranian Oil Company, forcing the ruling Shah to abdicate in favour of his son, Mohammad Reza Pahlavi. A decade later Shah Pahlavi’s position was threatened when the Anglo-Iranian Oil Company was nationalised by his Prime Minister, Mohammed Mosaddegh, who was removed from power in a coup codenamed Operation Ajax in August 1953, organised and carried out by the United States’ CIA at the request of the British MI6. After the 1953 coup, British influence in Iran began to wane and the country became one of the client states of the United States. During the following two decades, the grateful Shah began to spend his ever- increasing oil revenues on expanding his armed forces with the latest American equipment, and state-of-the-art combat aircraft for the Imperial Iranian Air Force (IIAF) in particular. Since the early 1970s, Soviet MiG-25R Foxbat supersonic interceptors had regularly overflown Iran with immunity from attack by the IIAF. The search for a new fighter/interceptor began with senior Iranian pilots test flying virtually every Western fighter aircraft available at the time, plus covertly flying MiGs in other ‘friendly’ countries. In the end, the Grumman F-14A Tomcat armed with Hughes AIM-54A Phoenix AAM, unquestionably one of the most potent warplanes in the world at that time, was selected in August 1973 as the IIAF’s principal interceptor. The importance to US foreign policy of the Shah was indicated by the fact that Iran was the only export customer for this sophisticated and expensive package. An initial order signed in January of 1974 covered the purchase of 30 F-14s, but in June an additional 50 Tomcats were added to the contract. The Iranian Tomcats were virtually identical to the US Navy F-14A variant, with only a few classified avionics items being omitted. The base site for Iranian Tomcat operations was Khatami Air Force Base at Isfahan and 1 Squadron at Shiraz Tactical Fighter Base. Imperial Iranian Air Force aircrew, mainly experienced F-4 pilots, began to arrive in the US for training in May of 1974, the first pilots going to Naval Air Station Miramar in California and the second group to Naval Air Station Oceana in Virginia. After completion of F-14 training in USA, they returned home to become IIAF F-14 instructor pilots with one of them remaining in the US to test fire the Phoenix missile. After returning to Isfahan, the qualified instructors started training the rest of the pilots with the co-operation of four American F-14 instructors who were part of the original contract. The Iranian Tomcats were fairly late on the production line and were therefore delivered with the Pratt & Whitney TF30-P-414A after-burning turbofans, which were much more reliable than the compressor-stall-prone P-412A engine. The first two of 79 Tomcats arrived in Iran in January of 1976, one of which was flown by an IIAF pilot. By May of 1977, when Iran celebrated the 50th anniversary of the Royal House, 12 had been delivered. During this period Soviet MiG-25 Foxbats were still overflying Iran and the Shah ordered live firing tests of the Phoenix to be carried out as a warning. In August of 1977, an IIAF Tomcat crew shot down a BQM-34E drone flying at 50,000 feet and the Soviets took the hint and promptly ended the Foxbat overflights. The IIAF Tomcats bore the US Navy serial numbers of 160299/160378 and were assigned the IIAF serial numbers 3-863 to 3-942, later 3-6001 to 3-6080. The 79th F-14 was delivered to Iran in 1978 with the last Tomcat, BuNo 160378, being retained in the US for use as a test bed. Iran had also ordered a total of 714 AIM-54A Phoenix missiles, but only 284 were ever delivered. However, the Shah’s westernisation of his country and authoritarian rule alienated the powerful mullahs and following massive demonstrations and the imposition of martial law, he was forced to flee from the country in January 1979. A Revolutionary Council presided over by the exiled cleric Ayatollah Khomeini took over the reins of power and established the Islamic Republic of Iran and set about eradicating the relationship with the West, and the United States in particular. The defence budget was severely curtailed and all outstanding orders placed by the Shah’s government, including an additional order for 400 AIM-54A Phoenix missiles, were cancelled. This was followed by the imposition of a strict arms embargo against Iran by the West which caused a severe shortage of spare parts and skilled personnel, in addition to which many experienced pilots and maintenance personnel had followed the Shah into exile. As a result, by 1980, the air force was only a shadow of its former self. This embargo was to have an especially severe long-term effect on the Tomcat fleet, since the embargo prevented the delivery of any airframe or engine spares, and air-launched weapons. The shortcomings of the new Islamic Republic of Iran Air Force (IRIAF) were highlighted when the sporadic war with neighbouring Iraq gained momentum in 1982 when Iran launched an offensive to regain much of the border area occupied by Iraq in late 1980. Air power did not play a dominant role in the Iran-Iraq war but during the early phase of the war, Iranian aircraft had the fuel, armament and the endurance to win most of the aerial encounters, either by downing Iraqi aircraft with their first shot of an AIM-9 sidewinder or else by forcing Iraqi fighters to break off the engagement. Iranian pilots initially had the edge in training and experience, but as the war dragged on, this advantage was gradually lost because of the repeated purges within the ranks of the IRIAF that removed experienced officers who were suspected of disloyalty to the Islamic regime. As the stalemated war continued, the IRIAF could not generate more than 60 sorties per day, whereas the number of sorties that Iraq could mount steadily increased year after year, reaching a peak as high as 600 in 1986-88. It is extremely difficult to get any reliable estimates of just how many Iranian F-14As were in service at any one time during the war, with some having to be cannibalised to keep others flying. In the summer of 1984, it was estimated that only 15 to 20 IIRAF Tomcats were operational. However, although few of them were available for air combat, several were used to good effect serving in a mini-AWACS role by virtue of their powerful AN/AWG-9 radars and two-man crew. Those that were able to engage the enemy during the war, scored most of their kills with AIM-54A Phoenix missiles, losing only one Tomcat in combat when it was caught off-guard while operating as a singleton by an Iraqi MiG-21, apparently a Fishbed modified to fire Magic Mk.1 AAMs, after which all the Tomcats operated in pairs. Another was lost when its crew ejected after losing control when the aircraft entered in spin and a surface-to-air missile (SAM) hit another F-14 over the disputed Kharg Island in the Persian Gulf. Iraq’s late model Mirage F.1EQ-6 fighters with Super R-530 AAMs were the closest it had to match the Tomcat, finally downing a pair just before the end of hostilities in the summer 1988. The IRIAF’s top-scoring pilot was Brigadier General Jalil Zandi who served for the full duration of the Iran-Iraq war. His record qualifies him as an ace and the most successful pilot of that conflict. Described as ‘brazen’, he began his career in the Shah’s IIAF and stayed on to serve in the IRIAF when it was somewhat dangerous for pilots to continue their military service. While a major, he often clashed with his superior Col Baba’ie, the officer responsible for keeping Iran’s Air Force in the skies. He spent at least two periods in prison, one under a threatened death sentence that was decreed by revolutionary Mullahs. Nevertheless, he was reliably credited with shooting down nine Iraqi aircraft and three probable kills. These included two MiG-23s, two Su-22s, one MiG-21 and three Mirage F1s. His record made him the most successful F-14 Tomcat combat pilot ever. 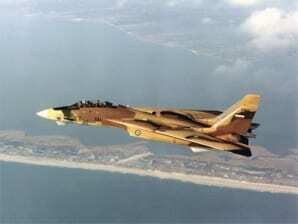 He was shot down once, in February 1988, when his Tomcat was hit by missiles fired from Iraqi Mirage F-1EQ. He tried to return to base but his remaining engine failed and he was forced to eject. He rose to the rank of Brigadier General and his last official post was Deputy for Planning and Organisation of the IRIAF. He died in a car accident near Tehran in 2001. In spite of the Western arms embargo, Iran has been able to maintain a more-or-less steady supply of spare parts for its fleet of Tomcats from several sources including the Iranian Aircraft Industries based at 1st Tactical Air Base in Tehran. Some may also have been smuggled into Iran by Israel and it has been rumoured that the Russians provided assistance to upgrade Tomcat’s ageing airframe, and it has been experimentally fitted with a Russian-built engine and ejection seat. The US government also supplied a limited amount of arms to Iran in exchange for its assistance in getting hostages held in Lebanon released although these were unlikely to be F-14 spares. However, as a result of the notorious Iran-Contra scandal, Iran was reported to have received Tomcat landing gear equipment and avionics. Iran’s indigenous aircraft industries have kept the AN/AWG-9 radar operational, and the IRIAF Tomcats are capable of firing AIM-9 Sidewinder and AIM-7 Sparrow missiles and anti-ship missiles. Most Iranian Tomcats fly with a missile load of four Sparrows and two Sidewinders for air-to-air operations. Iran is reportedly developing a domestic version of the Sparrow to replace its stock of expended missiles. The IRIAF has also experimented with a number of Raytheon MIM-23 Hawk surface-to-air missiles for carriage on its F-14 Tomcat fighters in the air-to-air role under a programme known as Sky Hawk and has recently revealed its own version of the Hawk, the Shahin, which it claims to be under production. A number of foreign nationals have in fact been implicated in efforts to illegally smuggle aircraft components from the United States to Iran. Two men were charged in December 2000 for attempting to illegally purchase F-4, F-5, and F-14 parts and ship them to Iran by way of Singapore. A fugitive named Houshang Amir Bagheri is also listed on the US Customs ‘Most Wanted’ list for his attempts to acquire classified F-14 components on behalf of Iran. “Given the current situation in Iran” the US Department of Defense announced in January 2007 that sales of surplus spare parts for the US Navy’s recently retired F-14s were to be suspended due to concerns that they could end up in Iran. In July 2007, the remaining US Navy F-14 Tomcats were being scrapped to ensure that F-14 spare parts would not be acquired by governments “considered hostile to the US”. In the summer of 2010, Iran requested that the United States deliver the 80th F-14 it had purchased in 1974 but delivery was withheld after the Islamic Revolution. The request was rejected but it is not clear if this aircraft still exists. Iran now claims to have more than 20 operational F-14As and as many again in storage for spare parts. The Iranian aerospace industry has been producing up to 70% of spare parts for several US types including the Tomcat, and IRIAF’s Tomcat Overhaul Centre at Isfahan has been modifying the extant fleet’s wiring and fire control system for compatibility with iron bombs, to become ‘Bombcats’. Three Tomcat units, the 81st, 82nd and 83rd Tactical Fighter Squadrons, are all based at the 8th Tactical Fighter Base at Isfahan, the last home of the outstanding F-14 Tomcat, one of the world’s greatest long-range interceptors, the last of Grumman’s fighting felines.